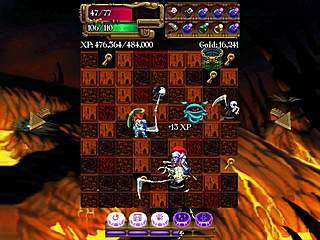 The key feature of Knightfall: Death and Taxes is its genre combination of puzzle, match 3 and RPG. You are supposed to match same-colored blocks, but that’s not your aim, it’s just a method to solve the puzzle. 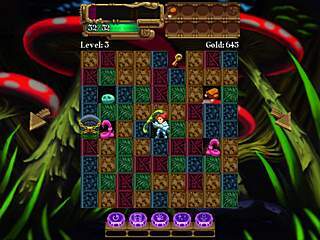 In most of the levels your hero needs to collect all of the keys and get to the exit. It could be an easy thing to do if not some tricky factors. The one is the enemies you meet on your way, and the other is a turn-based RPG – the amount of your Action Points each level is limited. The AP decrease as you remove blocks from your game grid. If you move off the blocks of three and more it costs you a single AP, removing less blocks will squander far more. So be prepared to show your best at block-management. Otherwise you’ll see an unusual for the casual games caption – “Game over”, which justifies the word “death” in the name of the game. Choosing a character to play is a serious dilemma. It’s all not about the gender; it’s about the abilities of your future fighter. Knightfall: Death and Taxes is the third game in the series developed by Megadev. It differs from the previous ones not only with the plot. Knightfall: Death and Taxes offers much more. In order to complete story mode alone you’ll need to succeed in at least 100 stages of block breaking, enemies fighting, but what is more for the first time you can try yourself as a Princess, not a Knight! Besides there are an endless mode and a survival mode where you protect a puppy. Talking about the game story it doesn’t play a big role. The thieves have stolen the money that the Knight and the Princess had to pay to the taxman. And you might agree that there is no monster that is more frightful than a taxman. That is why our heroes decide to pursue the robbers to get their money back. As it often happens a man and a woman couldn’t agree on the strategy. As the game lacks overvoicing and isn’t subtitled it is really funny to watch their dispute. The developers did a great job making the dialogue in pictures. By the way the game’s graphics are absolutely distinctive. At first sight it seems to be really poor and retrograde, but when you start playing you somehow enjoy it and by the end of my journey I even couldn’t imagine any other variant. So there are several locations you can go back and forth to. There you get into the match-3 game grid where you should go through the levels. In between the locations you may meet some other characters to chat with. These intermediate scenes are always watchable, often extremely amusing and funny. But to tell the truth they’re not well integrated into the rest of the game, so that it has no value if you take it from the point of RPG. Choosing a character to play is a serious dilemma. It’s all not about the gender; it’s about the abilities of your future fighter. All the monsters that you’ll have to battle with have different attacking properties (some of them can even poison you, and the others are just better to avoid) and both the Knight and the Princess fight differently as well. If you decided to be the Knight you should get above your enemy and use his drill-lance weapon to drill down and onto the head of the monster. Being the Princess you need to get below monsters to use her helicopter blade-like weapon. But no matter whom you play for, you get bonus experience points for lining up multiple enemies and cutting through them in a single move. Both the Knight and the Princess have their own special magic moves. But the moves can be activated only when your magic bar increases through usual play. These range from devastating offensive moves (like clearing the whole screen of enemies) to healing a chunk of your health. As about the puzzle part it mainly concerns the way of finding most effective way to level up. The point is that the Action Points make all you think of your next steps thoroughly. As the game grid can be turned around at 90-degree angels you have to take into consideration the effects of gravity that can either bring you to the object or bring the object to you. Along with the Action Points you have Experience Points that should be accumulated. I think there is no use to explain how much important the experience is in any sphere especially the battle field. Have you already forgotten about the money? While you still hope to find yours you can also earn some. 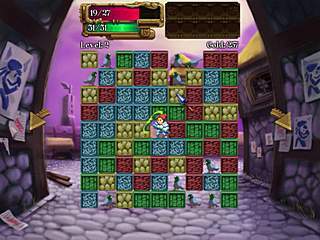 The money is earned by leveling up and found in the game grids of various levels. In its turn the money can be spent on armour and other helpful items in the shops which are spread around the land you’re traveling. Knightfall: Death and Taxes is really an unconventional game. And if you didn’t feel like buying it just watching the screenshots, try a promo version first – you might change your mind. The game is gripping from the very start. Wonderful exlpanaiton of facts available here. Good day! I just want to give an eonumors thumbs up for the nice data you could have here on this post. I might be coming again to your weblog for extra soon. I could watch Schindler's List and still be happy after reaidng this. This is Knightfall: Death and Taxes review. Download this game here.